When I was in art school, one of the first people that I met was Jen Tong. Being away from our hometowns in the Big City, we gravitated towards each other and formed an island within an island. Not only is she an amazing person, but I have always been impressed by her talents. We're lucky to have her show in Ligonier! Jen shows all across the country, including some prestigious galleries and art festivals! The show that Allegory Gallery will present is called, "Creatures of Ghost Island". It features ten original works (paintings, inked drawings, and silkscreen prints) and opens on Friday, February 1st. The show will be up for the month of February and is simply amazing! (The opening reception is from 5PM to 8PM.) The show is a fantastical world, complete with witches, ghosts, woodland spirits and mushroom forests! If you'd like a sneak peek of the show and a glimpse at her process, CLICK HERE. Sometimes when I'm a little blue, I break out the soup pot. On chilly days like this, there's something almost magical about how comforting a hot bowl of soup can be. It's like a warm hug from the inside out! 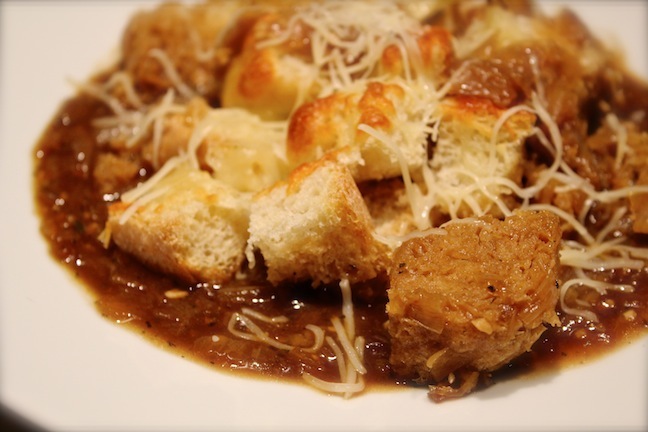 Our friend Ron baked us a loaf of French bread and I knew that I wanted to make French Onion Soup to go with it. I think the secret of a successful French Onion Soup is to allow the onions to get a nice dark caramelization. It gives the soup depth and makes the flavors richer. I also deglazed the pot with white wine. I've seen some recipes where they just add the beef stock, but I think the acidity and fruitiness of the wine helps balance the buttery/fatty richness of the onions and the stock. I'm going to have to hit up the Goodwill and find some vintage brown and tan soup ramekins, because my little, white creme brûlée ones were not going to cut it portion-wise. I opted to take a baking dish and ladle out some of the soup into it and fix the topping as usual. After it was toasted, soaked up some soup, and the cheese melted, I scoped out equal shares onto the much bigger (non-oven safe) bowls of soup... and then sprinkled more cheese on top. I think cooking can teach us life lessons: Sometimes you've got to deviate from the recipe and work with what you have; the results could be just as good or even better. Earlier today, I had a conversation with a friend. It was one of those conversations that makes you feel a little older afterwards. You find yourself saying soothing words of comfort and realize partway through that you're not just saying them to the other party, but to yourself as well. Over the weekend, she closed the doors to her shop... permanently. She said that she felt liberated and free... but I could tell she was sad. In the past few months, I've had too many of these conversations. Too many good people have lost their livelihoods. Each time I hear about another small business folding (particularly one like our's), a chill runs down my spine. Are we next? I have to push the thought out of my head. I have to focus on gratitude. It's easy to get sucked down in a pit of worry and despair, especially this time of year. The skies become a soupy grey mess and the sun plays (extended) hide-and-seek. I know that we're fortunate for all the support we have. It humbles me. Each kind word, friendly face, and purchase (no matter how small)... all go towards making the dream a reality. It's this support that fashions a shield against the dark. I know that we must be dauntless and stay the course. I've been busily adding lots of new things to the online Shop lately. I'm doing one last big push before we take off for Tucson for a little extra spending money. I've been dreaming up all the things that I want to bring back to the shop! Anyway, I added some more Painted Ceramic Beads, new Art by Cynthia Thornton, Jenny Davies-Reazor, and Sheila Thornton, Milagros Grab Bags, new Premium Czech Glass, AND I'm destashing my collection of enameled beads I made. So there are LOTS of new things in the online Shop to check out. 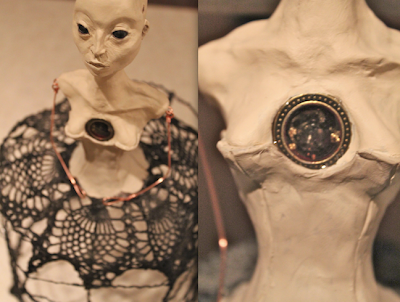 If you aren't a local, you might not have seen the pieces by Jenny, Cynthia, or Sheila. They've been in exhibitions in the past, but I haven't had them online yet. If you get a chance, definitely take a moment to check things out! (I also marked down all the fine silver headpins in the Metal Clay Component Destash and all the Premium Gemstones.) So it's a good time to pick up some lovely things! 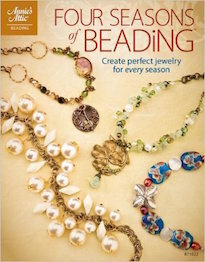 Do you enjoy altering store bought beads? Lisa's looking for thoughts on the "blue wash" she's working on. Get hammered and make some pretty Valentine's Day jewelry. Now that Carmi has a new resin clay to work with, options are endless for mold making! The Memories and Thanks Blog Hop which was orchestrated by the wonderful Lori Anderson was very moving to participate in. Jean thanks a young friend of her son Robert for her devotion and for everything she has done for Jean's family! Andrew shares three class samples he made using Premium Seed Bead Mixes and peyote stitch. I would like to introduce you to My Steampunk Lady! The idea to make her came from the fact that on February 22nd, Allegory Gallery and Second Chapter Books will be hosting a Steampunk Party. I wanted to make a prop for the window and started working on different concepts. One of the things that I have been wanting since we opened was a vintage mannequin to display some of the jewelry from the store. Sadly, finding a nice one for a good price is akin to the search for the Holy Grail. So, I did the next best thing and made a small scale version. 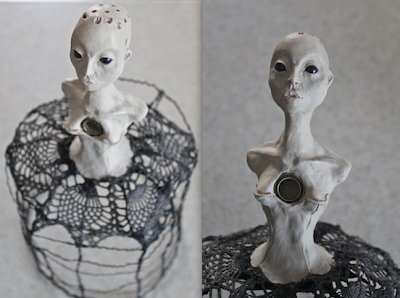 I'm really happy with the way she turned out and I can see myself making more figurative based work in the future. The nice thing about having a bead store is that there are ample amounts of supplies at my disposal for working with small-scale projects. For instance, the eyes are made from Swarovski crystal pearls, the "window" for her clockwork heart is a ring from TierraCast, and the cage that makes up her body is created from Soft Flex Company's Craft Wire. 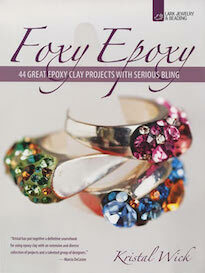 I also used the two-part epoxy Crystal Clay on several occasions. Sometimes things don't work out perfectly. Originally I had the idea that I would have her body sit up higher and the folds of her dress would morph into the bars of the cage. But as I was working on it, it reminded me a lot of the toilet paper covers that my grandma made from Barbie dolls and crocheted dresses. The solution was to saw the bottom half of the sculpture off just beneath the line of the corset for a smoother transition. This meant that she wouldn't sit as high up as I would have liked, but I had a solution for this particular conundrum that I'll go over later on in the post. Even though the above picture might not look too exciting... just a stump, really... it shows clues to my process. I first built an armature out of crumpled aluminum foil and layered Super Sculpey over it. I also ran wires through the entire top part of the body with the aim to anchor it to the bird cage body. This next set of pictures shows a couple of different things. 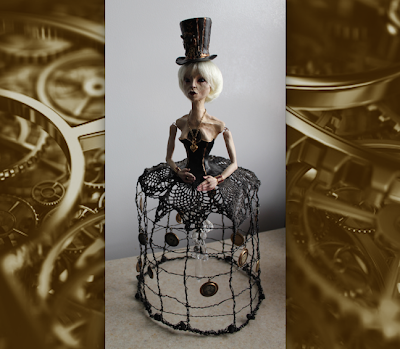 I wanted to integrate the body with the bird cage a little more, so I thought that I would use vintage lace to add an additional Steampunk element and tie in the bottom half with the top half more cohesively. The problem was that I couldn't find my box of vintage lace! I did find a crocheted doily and played Frankenstein with it and cut it up. I was worried that it would unravel completely, but I managed to get everything glued and sewn down. I then went over and soaked the doily with watered down acrylic paint to make it darker and give the lacy doily more structure. I think it looks almost like wrought iron. This set of pictures also shows the holes I drilled on the head. I had this idea that I would root the sculpture myself with some felting roving I had on-hand. I played around with it and came to the conclusion that it simply wouldn't work. So I quickly ordered a few different doll wigs online. I didn't really want to master wig making for this project that wasn't supposed to take very long. The pictures also show the first layers of gesso. 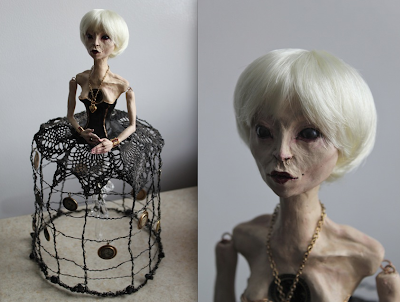 I did some research on painting dolls and a lot of artists will use the natural color of the material that they're working with. The flesh toned polymer clay wouldn't be so bad, but the problem was that in some spots, the layer of clay was thinner and the aluminum foil armature could be seen just below the surface or peaking out a bit. Not only that, but I like the look of the thickly painted santos figurines and wanted to duplicate that look to an extent. This set of pictures shows my early attempts at figuring out how to attach the arms without them getting too bulky and have a nice range of movement. (I thought that I'd make like these screw eyes and use some kind of adhesive to help hold them in. But I ended up drilling a hole all the way through and running a wire through it to dangle the arms from. 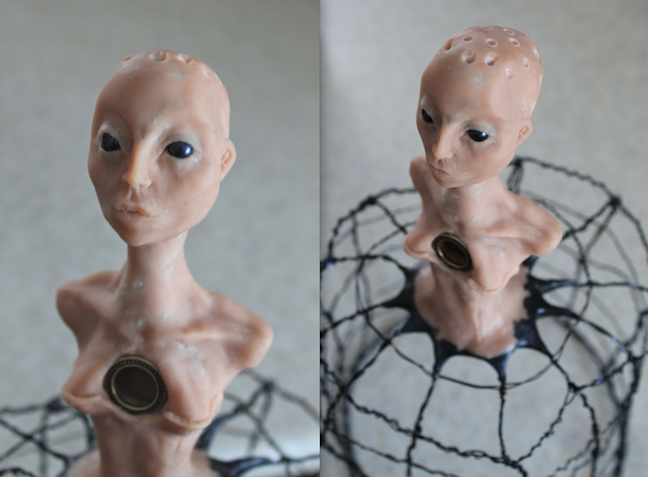 On the suggestion of a friend, I left the arm joints exposed to make it look less life-like and more doll-like. I lightened the picture on the right to show what I did with the cavity in her chest. I filled it in with watch parts, bits of gold leaf, and encased it all in resin. Here's a detail of the corset strings I carved in the back of the piece. I figured that since it would be in the window, people would see it from the front looking in and they'd see it from the back looking out the window. So I wanted to make sure that I considered the back as much as the front. One facet of Allegory Gallery is that it's a bead store. I wanted to show some of the beading techniques in this piece. It made perfect sense to make her jewelry! This picture is a detail of the peyote stitch cuffs and a detail of the hands. (You can even see the ring I made for her out of two part epoxy clay and a Swarovski crystal from a cup-link chain.) The hands are pretty rough in the rendering, but I did them really late at night and I didn't want them to be too fragile. The fingers are bonded together in a robotic-karate-chop-action pose, but they also flattened out in the oven a little more. Originally the hands were closed a little more. Now they're flat-palmed. Her dress, which was inspired by the birdcage-shaped silhouettes of bustle-laden Victorian ladies, is hung with portrait pendants of her imaginary paramours. I blacked out their eyes to match her dark eyes. I also wired gunmetal beads and black quartz beads along the bottom of the cage to make sure that the sculpture wouldn't get top-heavy. Here's a picture of her with her skin and make-up painted in. It's also a picture of her with her wig on. When I was measuring the head for the wigs, I must have miscalculated or measured it wrong, because all the wigs that came were massively too large. I ended up having to cut it apart and sew back together this particular "Milk White" colored wig. The picture also kind of shows what's hanging on the inside of the cage. It's a cluster of different kinds of clear glass and clear crystal beads and pendants that were wire-wrapped onto a chain. In these pictures, there are some of the final details. On the left, it shows what the corset strings look like painted and it also shows the seam between the doily and the corset. I was originally going to make a hard line, but then it looked like she didn't have legs and was propped up on top of the cage. So, I took a rolled up coil of epoxy clay and smoothed out the transition between the actual fabric and the sculpted fabric. 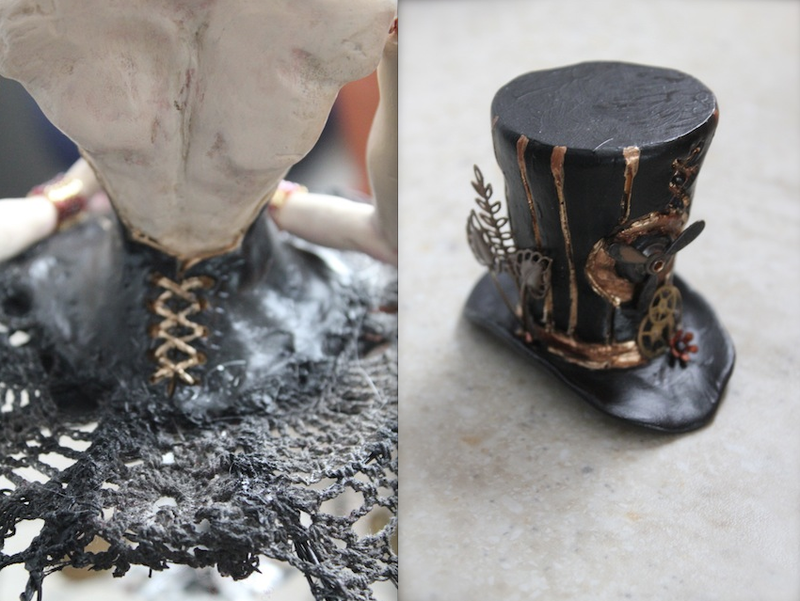 On the right, it shows the top hat that I made for her. It was my solution for her to sit up higher. I made the hat out of a mix of Super Sculpey and the ultra light Sculpey. I was worried that if I started out making this piece thin, it would collapse. Thusly, I made it one solid piece and then used a drill bit to hollow it out. The hat is embellished with a moving propeller, a vintage flower headpin, watch gears, and then some natural brass filigree from Vintaj. I'm really pleased with the way this figure turned out. I almost considered making her a male companion, but I ran out of time. I'll take a picture of the window once it's completed. I got a small cabinet that I'll be painting and embellishing that she'll sit on top of. We're considering doing a local science fiction convention called, Sci-Fi Valley Con, and I can see myself doing a series for that of Steampunk characters in painted backgrounds. Maybe something like Shintaro Ohata, but more in my own style. The convention is in May, so I have a little time to plan. Not that long ago, I found a box of polymer clay and I was inspired to make some beads with what I came across. Of course, many of the packages had been opened and things had started to dry out, but after applying a lot of pressure and a little bit of muscle, I was able to salvage the clay. I made a mountain of polymer clay beads! I sanded and buffed the beads by hand, creating a nice satin finish. Here's a necklace that I made with a combination of tiny copper rounds, matte brass rounds and coppery-colored freshwater pearls. For the focal, I created a pendant with the polymer clay bead and some studded bead caps. I love how the rich garnet reds of the polymer clay bead play off of the warm metal colors of the base necklace. For this bracelet, I wanted to embrace a cooler color palette to showcase the denim-colored polymer clay bead. I used dark blue spectrolite (aka labradorite), matte lave rounds, faceted iolite rondelles, sterling silver spacers, silver fire-polished Czech glass, and I brought it all together with a sterling silver clasp from Saki Silver. I really loved the red beads that I made, so I created another sample of what can be done with them. This time I made a bracelet. To showcase the polymer clay bead, I used a combination of fuchsia labradorite, bronze textured discs I made, brown freshwater pearls, onyx rondelles, vintage metal Mala beads, patinated daisy spacers, and used a triangular toggle from Nina Designs to tie it together. 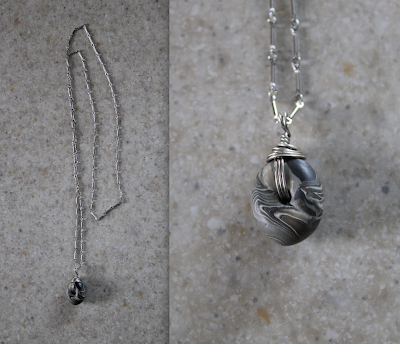 I really loved the patterning in the gray "riverstone" beads and wanted to showcase it by creating a super simple design. I wire-wrapped the bead and hung it off a long silver bar chain. For the army green bead, which actually has very subtle streaks of orange and teal, I wanted to keep it pretty simple as well. I wire-wrapped it with textured bronze discs and added a wire-wrapped dangle strung up with a natural garnet. 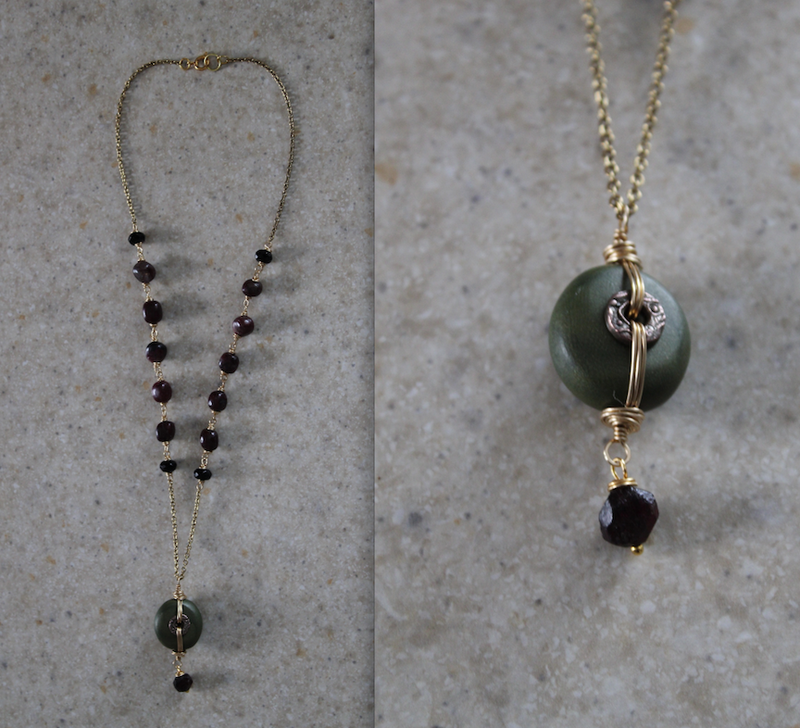 This hangs from a gold-toned chain with segments of wire-wrapped fuchsia labradorite links. If you'd like to play with some polymer clay beads yourself, we've got them listed in the online shop! (We also have a basket of them in the brick-and-mortar store.) They are put together in bundles that play with different color combinations. You can find the bundles by CLICKING HERE. 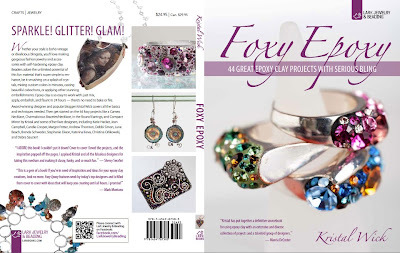 Last year I had the distinct honor and privilege to be asked to contribute pieces for Kristal Wick's new book, Foxy Epoxy: 44 Great Epoxy Clay Projects with Serious Bling! 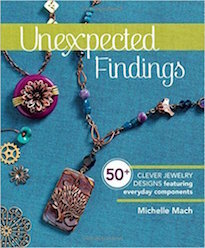 I am so fortunate to join an all-star crew of extraordinary jewelry-makers! It was a lot of fun creating work for this book that highlights a really amazing jewelry product: two-part epoxy clay. Epoxy clay is simply magical. The book is due out in June, but pre-orders are open NOW! CLICK HERE to Pre-order your copy today! I have an introduction to Peyote Stitch class coming up soon and I needed to whip up some samples. We'll be working with "larger" size 8 seed beads and I thought that I'd use some of the Premium Mixes to create the examples. I used the Iris Garden Mix, the Black Beach Bonfire Mix, and the First Day Mix to create these bracelets. I love the feel of them. They've got a nice fluid movement and I think they look pretty nice as well! When I lived in New York City, it was hard for me to imagine living anywhere else. I thought that I would spend the rest of my life there. So much of me was forged there. I use the word "forged" for a reason. The action of forging a raw piece of metal includes burying it in an inferno and then hammering it. Not only does this give it shape, but the task gives it strength. It's a dirty process that requires a lot of energy. I also use the word "forged" for another reason. It means "faked" or "counterfeited". I was living for so long in survival mode. While on many levels, I was fulfilled and content, part of me was always struggling for some thing genuine and real. The idea that the life you're living can be anything but "real", seems counterintuitive. But so much of what I did was due to a series of events that were out of my control. I worked to pay the bills. I lived where I did in part because it was where I could afford to live. Even the decision to have a pet was made for me. "No pets allowed!" But... the biggest concession... the biggest lie... was the idea that if you were an artist, you had to live in the City. I think when I started to be more genuine in my approach and made actions from a place of seeking something "true", some of the barriers started to dissolve and my life changed. I embraced the change. I learned to love, I honored my muses by pursuing a career in the arts full-time, and I opened myself up to the idea that I could be a catalyst of change and that if I wanted something, I could make it happen. I was not just subject to chain reactions... I didn't have to be just another domino to be knocked down. So, this is where I live. It's not just a place, but a state of mind. I am surrounded by beauty and can appreciate it. I didn't realize that what I was being forged into was a vessel. Closed, it remains empty and can only reflect the world on its surface, but when opened, it can be filled with potential and limitless possibility. 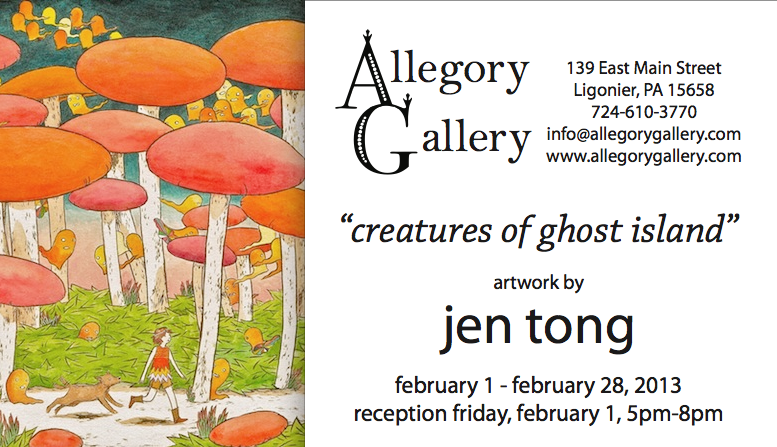 Here's an article about Allegory Gallery that appeared in the most recent issue of the Ligonier Echo. It describes Jessica Wiesel's new art show and how we paired it with the writing of Amy Yanity. It also describes some of the things that we do to promote synergy in the local cultural community and some of the philosophies of the store. When we opened the space, we thought about what kind of place we wanted to have and what we wanted to sell. The problem we had was that the "thing" that we wanted to impart wasn't necessarily tangible. We wanted to capture "creativity" and give it to others to make their own. But how? Answering the "how" is how we came up with our business structure. 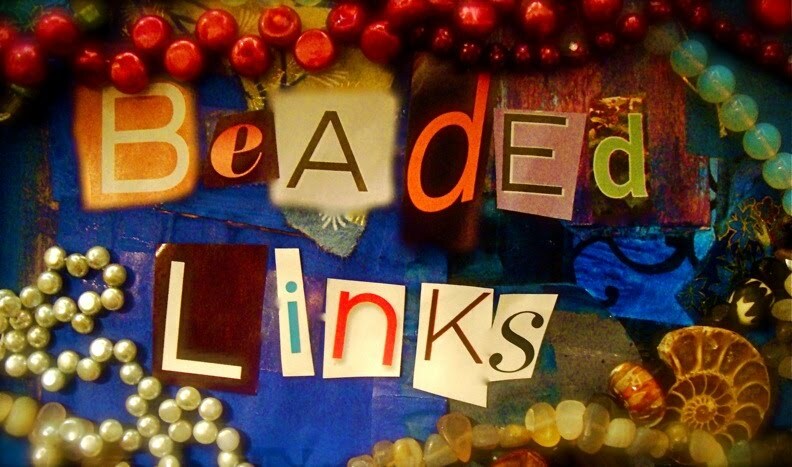 It was a multi-faceted approach – it's part bead store, part art gallery, and part educational resource. It hasn't been easy. Sometimes I think it would just be better to abandon some of the concepts and focus on one thing only. Then I think about how all the parts co-exist... they are cogs and gears that work together to move us forward, little by little. Eliminate one mission and the principle core becomes destabilized... things start to teeter. The more things we can do to strengthen our ability to set down roots and hopefully inspire others, all the better. When applied to a bigger picture, we act in the same way. We want to create cultural synergy and continue to promote the arts. 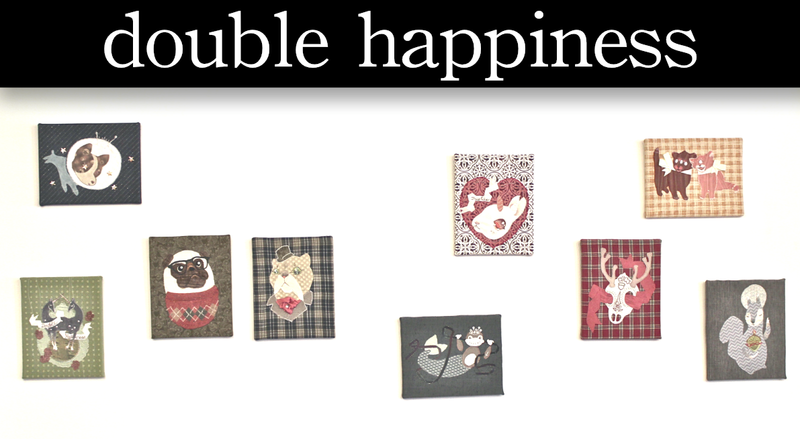 We are so happy... one might say, "doubly happy"... to present the latest show of the very talented artist, Jessica Wiesel. Earlier this month, Allegory Gallery hosted an opening for this unique art exhibition on the Project Wall. The show's title is "Double Happiness" and is composed of nine original "fabric collages". She came all the way from Asheville, North Carolina to attend the event. If you missed the opening and can't make it to the gallery, not to worry! You can take a look at these whimsical pieces up close and personal by CLICKING HERE. These fantastic works of art are available for purchase. Do you ever feel the need to adorn your ankles with jewels? Lisa is preparing to do just that! Now that ETI has a new resin clay, Carmi can work in 3-D, hence her Steampunk Wolf Cuff. 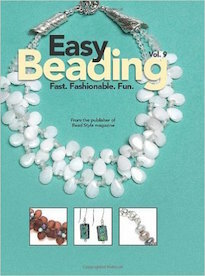 Jean shows and tells: a piece she made using wonderful Beads Mosaic shop components becomes "The Dragonfly Chatelaine". I don't work with neon colors much. While I do love color, I generally gravitate towards more subdue hues and less saturated tones. If I do use a bright color, I tend to use it in moderation and as an accent. I have noticed a trend towards fluorescent colors in the fashion world and have even heard people refer to it as an 80's revival. I picked up some of the new neon Swarovski crystal pearls and some rubber components from My Elements by Yvonne for the store. I also have some vintage plastic and glass beads that are dazzlingly bright and compliment the new additions. With these products on-hand at the shop, I wanted to create a display of examples of how these technicolor components could be used. Since this color palette is SO far removed from my natural comfort zone, I created a new color wheel. When I was helping students with their portfolios, I always encouraged them to create a new and personalized color wheel every time they started a new body of work. The thing about color (and using it in a personal way) is that our color sensibilities change. We are a product of our environment (both external and internal) and depending on factors like the quality of light at that time of year, current mood, and even the color of the rooms we spend the most time in can make an impact on how we see, feel, and work with color. Since I had to work on a display, I thought that I'd hit two birds with one stone and create a large-scale color wheel. Don't let the little picture fool you, this collage is 72" X 30"! While I was selecting images to work with, all I could think about was the phrase, "color explosion". As a result, the collage took on a very explosive energy. I also found fashion images from magazines and collaged them together as well. (It's much smaller at 14.5" X 20".) The overall look, reminds me a little of being in high school, but creating a design board is an effective tool to get a general sense of color combinations and textures that are currently trending. Here are the necklaces that I created. They're mostly pretty simple and rely a lot on repetition of pattern. The nice thing about this is that they can be layered together or wrapped around the wrist as a bracelet. The multi-strand turquoise and orange necklace is actually a vintage Japanese glass necklace that I restrung with the addition of the new Swarovski pearls. The piece to the right is more eclectic with a mix of beads and features a Pam Wynn polymer clay bead, vintage lucite, a ceramic bead from Nan Emmett, and a nice chunk of gaspeite. These are the bracelets that I made. Again, for the most part, they're pretty simple. With this batch, I went wild with the Memory Wire. I like how there's a sense of almost instant gratification. The ones on the bottom right are made from Memory Wire that has been passed through colored rubber tubing. The ends have little wire-wrapped dangles. They look particularly nice when a bunch of them are worn together. To the left of the Memory Wire "stackables" is a bracelet of turquoise, orange and white. While there are certainly neon components, I think that what gives this piece a real "POP" (besides all the movement of this piece) is that I've used complimentary colors. The contrast makes the bracelet zing! And here are the earrings that I made with this color palette. I think one of the fun elements of three out of four of the pairs is the use of anodized niobium earwires from Marti Brown of the Odyssey and Bead Expressions. The earwires add a nice, unique touch of color. I'm smitten with the earrings on the bottom right. I love how the wire can still be manipulated into shapes after being passed through the rubber tubing. They were pounded on an anvil with a nylon hammer to work-harden them and prevent the shapes from becoming distorted. A nice perk was that the rose pink of the balled copper headpin matches the pink of the rubber tubing! While this was certainly challenging, it was a lot of fun. It was nice to play around and use daring, bold, bright colors. The colors have a lot of life and energy. Working with the neons, fluorescents and complimentary colors has certainly inspired me to incorporate more of these explosive color choices in future work. 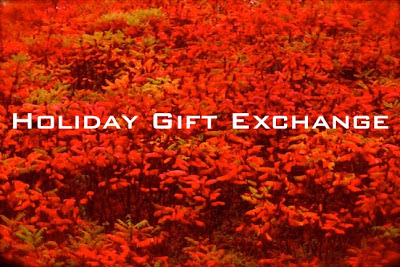 With everything that has been going on, I've been a bit slow on updating the Holiday Gift Exchange posts. 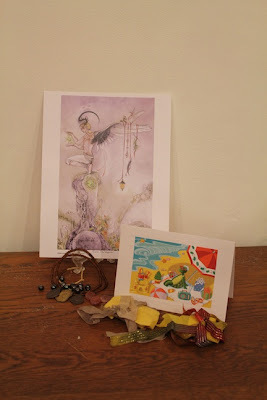 This is the last installation of the gift exchange that I hosted, but I'll be adding posts about the gift exchange that Lorelei facilitated in short order. If you were a participant of either exchange, you should be getting your very tardy gift in the mail shortly! I hope everyone likes what is being sent! Sorry again about the delay! I met Anne Terry a few years ago in Detroit. She was very kind in showing me where to set up for the show they put on. I knew that she did metalwork (as she created a stellar wearable frame for a collage I made), but I didn't know the extent of her mad seed beading skills. She has been working all year on these bead embroidered ornaments. How do I know this? Earlier in the year, Anne made a request that I create one of my pendants without a hole, with the aim of capturing it with a beaded bezel. She explained that she was working on holiday gifts. This ornament is the one she sent me! Wow! It's simply amazing. She put a lot of work into creating such a stunning ornament. It's truly a work of art that will become an heirloom in our household. 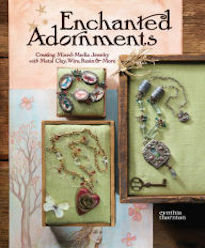 Speaking of ornaments, check out this lovely one that Lynne Suprock of Simply Pretty Stuff created for the exchange! I was quite fortunate in being able to receive this gift in person! Lynne stopped in the shop and dropped it off! It was so nice to see her. She participated last year in the Gail Crosman Moore Weekend Intensive. Ever since then, we have kept in touch. The ornament she gifted me was a special one that she has been holding on to for "special people" and was a soldiered piece she made using the artwork of Brian Andreas' StoryPeople. She created a line of these ornaments for the artist and this one features the "Christmas Dragon". The next collection of goodies come courtesy of Amber Dawn! I "met" Amber when she started the International Charm Day. For the past few years I've wanted to participate, but always found myself on the road or away. (This year, I've taken measures to insure my participation.) What a treasure trove! The bounty that Amber sent included handmade ornaments, Swarovski crystals, polymer clay charms, and a peyote stitched polymer clay piece with my name on it! For a better view of the holiday ornament she made visit her blog and CLICK HERE. She called it "spring in a bottle" and I cannot lie... it definitely evokes happy spring-time feelings. I'm so lucky to have been able to facilitate this exchange. I feel very fortunate! Thank you! I've been lucky lately. "Lucky" in the sense that I've been on a creative roll and have been making lots of beautiful things. Sometimes things are easier than others. Sometimes it feels like you're ramming your head against a creative wall and have to struggle for even simple projects to come together. This just happens to be one of those easy times, where things seem to work out and fall into place. The one conundrum is not having enough time. I find myself staying up later than I should, sometimes finding myself on the other side of dawn... still awake and still making things. As a reward for my efforts, sometimes there's the most amazing sunrises ever. Everything becomes awash in an unnatural red and the shadows become deep purples. The purples are so dark, they almost look black – an inky lettering across the sky, spiderwebbed and crawling upward. Part of me holds my breath, hoping that these creative times continue. When it's slow in the shop, I like to make simple jewelry pieces to stock the shelves. I try to keep things pretty understated and not too crazy. It's my aim to create very wearable pieces that can be worn alone or worn together. Above is a picture of all the pieces that I made the other day. I'm really happy with the way that everything turned out. From left to right, there's a piece with multi-colored stones (dyed quartz) and mixed chain, a capped raku bead on a length of copper chain, a mix of earrings, a Swarovski crystal pendant on a silver chain, a ceramic disc from Diane Hawkey hung from a wire-wrapped link chain of dyed tagua nut beads, a Steampunk necklace made with "found objects", a TierraCast button, a filigree pendant with a vintage button, and vintage metal Mala beads, a chain embellished with green turquoise wire-wrapped dangles, and finally a chain embellished with blue impression jasper and blue glass pearls. One of the things that we sell A LOT of are the handmade earrings. I think that there is just something nice about artisan-made earrings. In the top left, there's a pair of lever-back earrings with an antique-silver finish link from Kabela and Swarovski crystals hanging from the bottoms. On the top and to the right are capped kyanite beads with grey glass pearls at the bottoms hanging from silver earwires from Saki Silver. On the bottom and to the left are bronze charms made by me with the vintage metal Mala beads. On the bottom right are a pair composed of blue kyanite and Swarovski crystal pearls. I have been meaning to update the online shop with the new products for several days now. Sometimes I get so busy with everything else that there just isn't time enough to upload the pictures and post them online. Luckily, I was able to carve a few minutes from my schedule and work on adding the new pieces. The Black Beach Bonfire Mix was really successful and I wanted to do more mixes that were comprised of the same size of bead. Instead of working with an array of textures, sizes and shapes, the challenge becomes one more geared towards color and finish only. This new mix is called, "The First Day". It's named after the Edward Burne-Jones painting (of the same name), which served as the inspiration for the color palette. It's a blend of pale purples, pinks, grays, and a sprinkling of golds and coppers. CLICK HERE to find out more about this mix. I remember the first time that I saw a Van Gogh painting. Even though it was a bent and battered laminated poster hung in an elementary school, I thought it was alive and that the brushstrokes were moving. This mix, with the bright yellows, blues and greens attempts to capture that same spark of energy in his iris painting. CLICK HERE to find out more about this mix. A few years ago, I made these headpins. You can read about them when I made them by CLICKING HERE. I recently unearthed them. While I still love them, I've sort of emotionally moved past the headspace I was in when they were originally created and was half tempted to send them off to the refinery. Instead of melting them down, I decided to list them first and see if anyone else was interested in them. I broke them down into small lots and if you're interested, you can find out more about them by CLICKING HERE. One of the biggest sellers in my personal shop were these black skull beads carved from water-buffalo horn. I found them in a dusty tent in Tucson during the Gem Shows, never to be found again. They're so detailed that one customer who got them tricked her son and told him and his friends that they were the petrified skulls of faerie folk... AND they believed her! I found a small bag of them and decided to list them again. I only listed three, as I am keeping a few for myself. You can find them HERE, HERE, and HERE. And don't forget! If you like something, there's a little Facebook "Like" button underneath each of the listings. When you "like" something (even if you don't get it or it has already sold) , it lets us know the things that you're interested in seeing and we can offer more! It's just one of the ways that we tailor our online store for our customers and supporters of the store. I have been told that 80% of U.S. population is exhibiting some sort of flu-like symptom at the moment. While I'm not in full-blown snot festival mode, I'm still recovering. It's nothing serious. At least I don't think it is. It's just a lingering (and now infrequent) cough and a general lack of energy. I know that the key to getting better is rest. My mother can attest that I have never been one to listen to good sense... and thusly, I'm prolonging whatever is inhabiting my airways and my life. This gift comes courtesy of Tara Linda. I haven't actually met Tara in person, but over the years, it has felt as though I have. Isn't it weird, when even though a country separates you, there's still a strange and unfounded sense of familiarity and closeness? I can't explain it. I do know that I listen to her music while I make art and am thankful of our virtual friendship. If you're interested in checking out her music, CLICK HERE. Tara sent a lovely print from Stephanie Pui-Mun Law. While I haven't met Tara, I have met Stephanie. If you're interested in reliving the moment back in 2007, you can CLICK HERE or visit her WEBSITE. 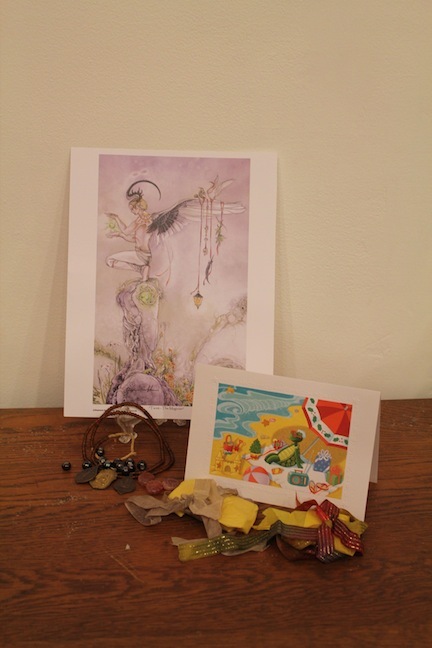 Along with the print, Tara sent a collection of jewelry-making gifts. She sent a selection of Buddhist pendants, large-holed pearls, root beer glass beads, polished fire agates, and raku pieces from Wondrous Strange Designs. You can visit their WEBSITE and check out the article that she wrote about them HERE. The next set of gifts come courtesy of Jayne Capps aka Boot-C. She's another virtual friend that I haven't met in person, but have corresponded with over the years. Jayne sent a handmade book of recycled papers, two beaded fairy creatures, two friendship bracelets and a CD of Funky Christmas music. I'm really thankful for the friendships that have lasted years and transcended both time and space. I feel really fortunate. The last gift of this installment comes from Christina Porter. I got to know Christina through her participation in the 2011 Readers' Challenges. She faithfully participated month after month. I enjoyed seeing what she made and how she transformed the set ingredients into something truly amazing. 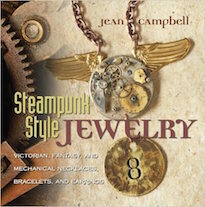 Christina didn't disappoint with her stunning Steampunk-style cuff that she sent. It's full of movement and is definitely a show piece. I really appreciate all the gifts. I'm closer to finishing and sending out the reciprocating gifts. I hope that people enjoy them. They're not anything really fancy... just stuff that I made with my heart and hope folks enjoy. Looking for a way to collaborate with blogger friends? 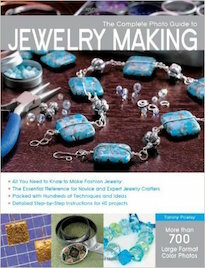 How about creating a jewelry collection? 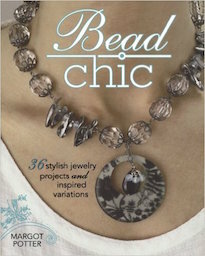 This was a woot of a trend in jewelry as well as home decor items during 2012. Beautiful colors and textures inspired by lovely peacocks form the theme of inspiration for this month's Art Bead Scene challenge. A fun t-shirt yarn necklace is blue! Fun imagery and resin can result in fabulous pendants that will make you smile. Exploring peyote stitch, Andrew shares how he transformed inspiration into a pattern. One of the activities that we participated in was a trip down memory lane with a look through old photo albums. 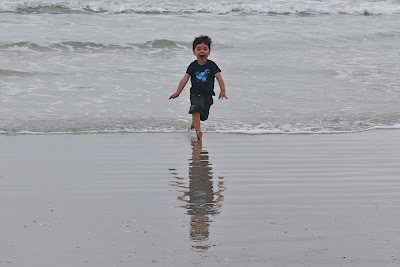 Since it was William's first time meeting my parents, it was almost obligatory and took on a particularly importance now that all the children have been reunited. While looking through the albums, I noticed a distinctive absence of pictures of me. When my brother left, my parents stopped taking pictures. An occasional school picture was found, but there wasn't much after age 7 until my sisters took up photography in high school (and those pictures were usually taken to document the horror on my face at the latest prank they pulled). I think this realization made me subconsciously trigger-happy with the camera. Besides sitting around the house and catching up (and eating and eating), we did go out and do a few things! We got up bright and early one morning and headed out to Blue Springs. During the winters, the manatees gather here. This must have been a record-breaking winter, because there were over 300 manatees spotted! On our way out, we saw a news crew pull in to cover the ample plenty. At the beginning of this post, I mentioned how a good many of the photos I took on this trip were of manatees. I also noted how many of the photos were pretty bad. In my defense, manatees are not the easiest of creatures to capture on film. For one, I had to hold the camera at odd angles to peer over the fawning crowd. Secondly, the sublimely clear waters of the spring distort the shapes and have a rippling reflective glare that can mask what lies beneath the surface. And finally, I was so bewitched by watching them playing and going about their marine-mammal lives that I forgot that manatees are not exactly known for their distinctive markings, unusual shapes, or vivid colorings. To be blunt, without their slow, watery gliding, they sort of resemble boulders or logs. Combine all these factors... and you get A LOT of bad pictures. With that said, we had a great time looking at the manatees and really enjoyed seeing so many of them. We saw this HUGE hollowed out tree that looked like it had been struck (several times) by lightning. Here's a picture of Azalea posing wide-eyed in a cleft in the tree trunk. I couldn't help but include this close-up of Max giving a Charming Smile. Here is the rest of the crew posing with the mosaic-tiled manatee sculpture framed by a curtain of Spanish Moss. From left to right: Steve, Azalea, Max, William, Sheila, and Cynthia. After our excursion to Blue Springs, we had lunch and made our way out to New Symrna Beach. This used to be a favorite high school hookie destination. It was relatively close to the school, cleaner than Daytona and had fewer truancy cops, AND due to its reputation as being a place to get bitten by a shark, there were also fewer tourists. Although it was much warmer than the Pennsylvania, it was still pretty chilly out and not the ideal beach weather. The kids still enjoyed it. They rolled up their pants and proceeded to splash around. Once unleashed on the beach, Max did not want to go back in the car to go home. He was just having too much fun! This shot is of William playing "airplane" with Max, which was a thin disguise for him to capture the fun-loving lad. I had a couple of other "more composed" pictures of the kids in front of the Christmas tree, but I thought this one summed up the moment best. Both of them were exhausted from the previous day's activities, but they got up super early in anticipation of presents. It was cute to watch them sleepily sit in front of the tree and police each other in not opening, touching, or moving the gifts. All of the grown-ups agreed to only get presents for the kids and not get presents for each other. William and I got Max a "Hulk Smash" action figurine. Of course, we didn't wrap it sturdily enough and once Max picked it up, the doll's head popped through the wrapping paper prematurely. This created a chain reaction. Here's a picture of Sheila playing with the Hulk doll and the Xanadu Barbie. The excitement of my niece and nephew was infectious. It was nice to see everyone so happy and festive. Although all the adults had agreed not to get presents for one another, Dwayne started working on these months before. He thought of each of us and translated them into our own distinctive ornaments by meticulously carving each one. They have a tribal elvish look to them. Couples got a matching set and this photo is of our ornaments together. I would be remiss not to include a picture of Cynthia's sweet master perfumery kit. We spent a good portion of the time down there crafting our own unique blends. We talked again about starting out own line of fragrances... and who knows... it might actually happen this time. I wanted to end this post with the picture of the perfumes, because family is a lot like a perfume. A perfume is a combination of essential fragrances that create the head, heart, and base. The formulas can be simple or complex, but each is unique to the ingredients added. These ingredients are like our experiences or memories, added one at a time. And like perfumes, sometimes family can get a little overwhelming at times. Even so, perfume like family accents our lives... it can reinvigorate us, inspire us, and give us cause to remember. And also like perfume, the bonds of familial ties are often invisible to the naked eye... but are surely there and can be detected at close proximity.